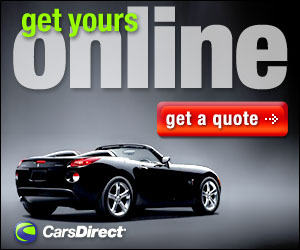 The truth is that car dealers need you to buy a car at the end of the year. They need room for new models, thus they need to get rid of the old. Notice the next time you see a car ad on TV during the holiday season that you won’t see anything for next year’s model, only this year, or there will be no specific year listed. The truth is dealers need the room for new models, and they want to avoid the tax liability for the older models when the New Year clicks over. That’s why you’ll see all those ads, and deals when December rolls around. Common sense should be your real indicator though. How many of us have the kind of money to buy a nice new car outright? We can picture it now. She walks out to the driveway and sees her brand new luxury sedan complete with big red bow: “Here’s the keys honey. Oh and the first payment is due on the 15th of next month.” Sure, that would make for a very ‘Merry Christmas’ indeed. It would be more like the day they spend searching for the places where she hid your corpse. Buying a car is one of the biggest purchases a couple can make, one that should be made together. The perfect gift for Christmas would not be a new car then, unless one has a death wish. Then again, who gets the perfect gift every Christmas? Oh we hope we do; drop hints, leave subtle suggestions. Sadly, it doesn’t always work that way. When we were kids it was a bit easier. During our youth the Sears Wish Book was the passport to all the perfect things we could get for Christmas. No messing around there; circle the picture, mark the page with a fold of the corner, then strategically leave it where a parent can find it. As adults we know that Christmas is really for children. The sweater and socks are nice, thanks honey. We hoped for the home beer making kit, or a bottle of Johnny Walker but the turtleneck sweater we will probably never wear is nice. It is the thought that counts after all. In reality as adults during the holidays we are just truly grateful to spend time with family and friends, be financially able to buy gifts for our kids and others and enjoy the downtime we usually get… No, seriously. Okay, there may be a little part of us that hopes we will get something nice for ourselves, something that will leave us with lasting memories, something that won’t feel scratchy on our neck. For Christmas 2015, we got the perfect present. Something that will leave us with pleasant memories, and it didn’t feel scratchy at all. And it was a car. Just about the most perfect car we could ever dream of. All thanks to BMW. On Christmas morning 2015, a 2016 BMW M6 was parked in our driveway. No there was no red bow on the roof, and truth be told we couldn’t keep it. But we did get to spend a glorious week with this fine, fine machine. We all know BMW makes fine cars. 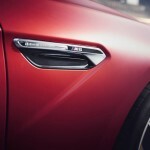 From the 3 series to the new “i” series, everything BMW makes is very good. 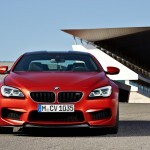 The M Series models in our view, however, are some of the most perfect cars on the road today. The M variants were introduced as performance models in 1984. Sadly the M6 disappeared when BMW discontinued the 6 Series in 1989. 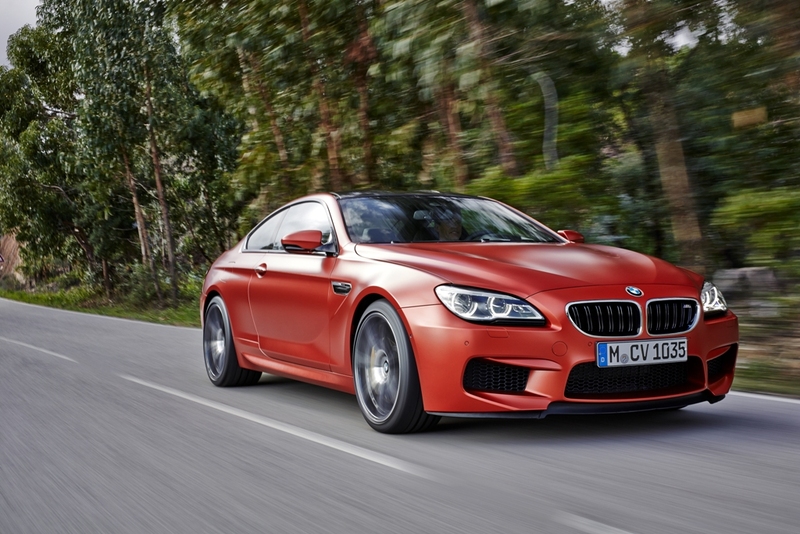 The M6 was thankfully returned to us in 2006 with the third generation launched in 2013. Under the long sloping hood remains perhaps the best part; a 4.4-liter, V-8 engine delivering 560 horsepower. As BMW says, this is truly the closest thing to a racecar you can drive every single day. All while swaddled in luxury and surrounded by top-notch materials and all the gadgets a driver will ever need. Standard equipment includes adaptive suspension dampers, a limited-slip differential, automatic adaptive LED headlights, LED foglights and taillights, heated power-folding auto-dimming mirrors, automatic wipers, and front and rear parking sensors. There is also keyless entry and ignition, ambient lighting, dual-zone automatic climate control, leather upholstery (with sun-reflective surfaces for the convertible), 16-way power heated front seats a power-adjustable steering wheel, a synthetic-suede headliner under the carbon-fiber roof in the coupe only, extended leather trim and carbon-fiber interior accents. All set atop 19-inch alloy wheels. In addition to the Bluetooth connectivity, there’s BMW’s iDrive interface controlled via a large knob on the center console and visible on a 10.2-inch display on the center of the long sloping dash. There is also a rearview camera, voice controls, a navigation system with real-time traffic, HD and satellite radio and USB/iPod integration that’s heard through a 16-speaker Harman Kardon surround-sound system. Optional upgrades include the Executive package. This adds a heated steering wheel, ventilated fatigue-reducing “active” front seats, a head-up display (which our tester had as a separate addition) Our tester also had the upgraded 16-speaker Bang & Olufsen audio system and a power rear sunshade. You can add the Driver Assistance Plus package, which includes a lane-departure warning system, frontal collision warning, a blind-spot monitor and a camera system with top-down, and around-the-corner views and a night vision system with pedestrian detection. Our tester had the optional 20-inch black wheels (silver can also be had) and Carbon Ceramic Disc Brakes. 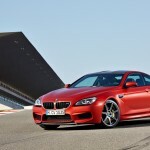 BMW also offers the Competition package that adds 48 more horses for the V8 engine along with lightweight alloy wheels, revised tuning for the suspension, steering and rear differential. There is also retuned stability control that provides a higher threshold for intervention in the M Dynamic mode; and a black chrome finish for the tailpipes. 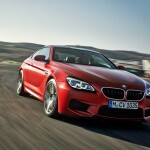 The first impression of the M6 comes at the first look. The low stance, long hood, aggressively sloped windshield and the curves make this a great looking car that appears ready to charge headlong down the road. It’s all accentuated by the huge M-specific air inlets in the front apron, and a dark carbon-fiber roof with a molded air channel. Combined with the large visible Carbon Ceramic Disc Brakes there is little doubt this cars mission is speed. Inside you are surround by a leather-wrapped dash, Alcantara headliner, and seated in comfortable handmade BMW Individual leather seats with 20 adjustments available in the front seats. While some have complained that the back seats are small, we actually took a short road trip with two adults in the back, both of whom enjoyed the experience and commented that while small the seating in the back was comfortable. Up front the old style round gauges are easy to see, however we spent little time looking at them as our tester had the Full-Color M Head-Up Display that projects all of the M-specific information you want to see right in to your line of sight. You can program it for all manner of things but we simply used it to keep our speed under control. And that’s something we happily struggled with the entire week. The 4.4-liter V8 roars to life with a low rumble that is music to the ears delivered through a beautiful quad-bank exhaust in the back. 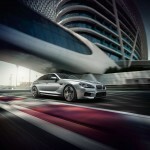 There are two options to deliver the 560 horsepower and 500 lb-ft of torque to the road. There is a 7-speed Automated Manual with paddle shifters, or has our tester had (thank the motoring gods) a 6-speed manual, a rarity in today’s newer cars. There is Dynamic Damper Control that lets you customize the shock absorbers’ firmness with three modes: SPORT+, SPORT, and COMFORT. The M Drive system also lets you save two driving settings, that can be activated with M1 and M2 buttons on the steering wheel. The chassis performance is also enhanced by the fact that the rear-axle subframe is bolted directly to the body without the use of rubber bushings. On the road, the drive is nothing short of Motoring Nirvana. This is the closest thing we have had to wheeling an exotic car on the street yet, even though this is not an exotic car. We were able to explode off the line and do a 0-60 time of 3.9 seconds, with a manual transmission, three times. Given our years away from a real racecar, this can’t be attributed to driver talent. Unlike an exotic car, the interior has enough room to actually breath, and enjoy the ride. As mentioned we took a short road trip and the M6 performed flawlessly, cruising at 85 miles an hour effortlessly and smoothly. 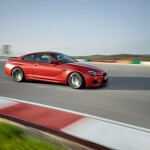 Aggressive cornering isn’t an issue and the upgraded ceramic brakes stopped the M6 very quickly. So quickly in fact that it actually took a short practice period to get used to them. Sadly the only thing keeping this fine machine out of the driveways of many, including ours, is the price. 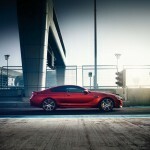 Starting at a base MSRP of $112,400 our coupe topped out at $130,200 with options. 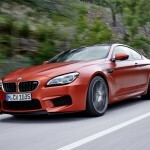 However, unlike other cars we have tested, the BMW M6 is worth every single penny. 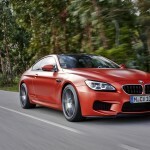 We had the 2015 M4 earlier in the year and loved it, however the M6 is like finding out your girlfriend has an older sister who is far better looking and more of a woman than her younger sister will ever be. So it is then that we love this car even more. Sure we may never actually own one, but for a week at least we had to enjoy easily one of the, if not the, the best cars we have ever driven on the street. Merry Christmas to us, and to all a goodnight. Front head room: 40.0 in. Front shoulder room: 56.9 in. Rear head room: 35.7 in. Rear leg room: 30.5 in. Rear shoulder room: 49.6 in. Cargo capacity, all seats in place: 13.0 cu.ft. Maximum cargo capacity: 13.0 cu.ft. Free maintenance: 4 yr./ 50000 mi.